Cherry Mobile announced their newest tablet available for only 6499 pesos, a 7-incher full HD phablet that is capable of 3G/HSDPA network, call and text function. This device was seen already on their 12 Cherrys of Christmas promo flyer and now it finally hits to our local stores and kiosks nationwide. These features a quad core processor with 1GB RAM size, 4GB internal storage and dual camera. Supports connectivity combo from Bluetooth, 2G EDGE, 3G, HSPA+, GPS and Wi-Fi allowing you to use every possible connections using this tablet. This is another great device you can get if you’re looking for a phone and tablet functionality gadget. It has a normal 7 inch screen with IPS display in capacitive touch screen. Powered by 3500 mAh battery along with the new power efficient variant of MediaTek processor which is the MTK 8389 clocked at 1.2 gigahertz. you may take a look at the few gathered Cherry Mobile Superion specs listed below for you and for others reference. *** check out Cherry Mobile Price list for 2014. 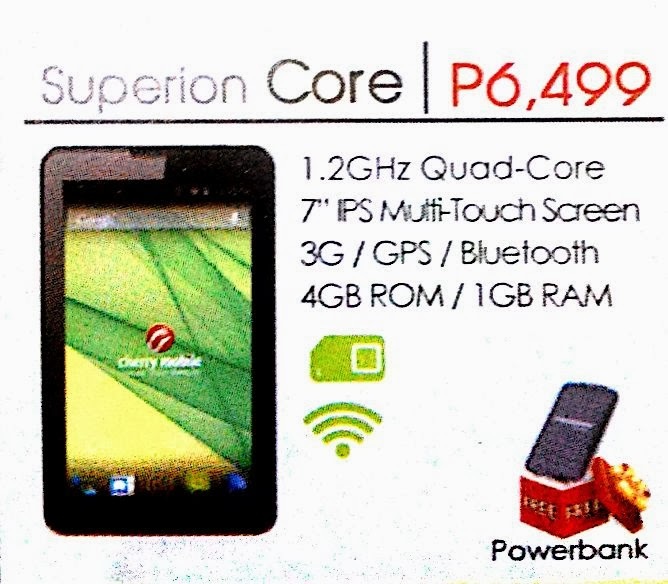 What’s good with Cherry Mobile Superion Core? First is the processor, if you love to throw task like games and apps to your tablet this should be the first you need to consider and next to it is the RAM. Since it is paired with 1G RAM you can be sure that this tablet handles with in terms of multitasking. Another thing is the resolution, HD IPS display brings this device more realistic in terms of rendering colors on display. Last is the connectivity, Superion Core can connect to cellular networks using the single SIM card slot and can make calls and text just like your ordinary cell phone. What do you think on this device guys, is it worth for your 6,499 pesos? Feel free to drop you comments below.